Greenie is worried that we are headed for a period of stagflation. We have news for you here also; stop worrying about it, as we are in this phase and have been in it since 2010. The only way we will move out of this phase is if we stop printing money, and that is not going to occur anytime soon. He was also pessimistic about the Euro; all we can say is finally. The Euro was a bad idea from the day it came into being. “It will break down, as indeed it is showing signs of in many different areas,” he said. He called the 19-nation currency region “unworkable” because it tries to meld the different cultures and attitudes towards inflation of southern Europe with the North. 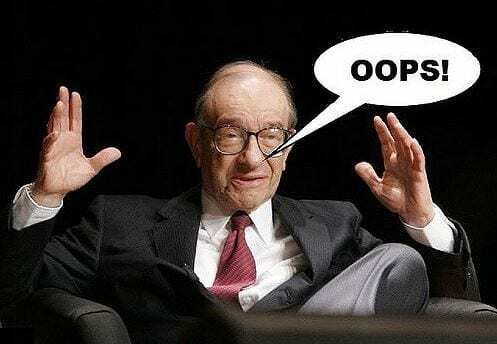 Greenspan either does not know what’s going or he is purposely singing a false song; we suspect it is the latter. He was never the most powerful person; it only appeared that he was such an influential person because the masses assigned that power to him. Otherwise, he is just another fly on the wall waiting to be swatted. Rates will not rise soon; if any nation embarks on rate hiking process, it will be the end of their economy. So his assumption on rates rising should be ignored or treated as the ravings of a mentally unstable person. On the issue of the EU, he is correct (for the most part); the EU is run by parasites in Brussels who are not officially elected and whose sole function is to take a nation’s hard money and impose rules that make life more difficult. The EU is set up in such way that it benefits Germany the most; Germany needs the EU because it provides it with weaker currency; the German Mark would be soaring in value, and a strong Mark would destroy its export-based model. The poorer members are offered low-interest loans, and it looks good until they cannot pay them back and then as they say the lovely story ends. That is what happened to Greece; being in the EU allowed it to borrow more money than it could ever hope to pay back.